Hazel Allingham writes: " I am a Third Year Student at Jordanhill, Strathclyde University. Last year I was on Placement in P4/5 at Harelesshill Primary School, Larkhall where I had a wonderful experience of a class of children who thoroughly enjoyed art, to my delight! We looked at the work of the Scottish Colourists, as I thought it was important for the children to be knowledgeable about Scottish artists from the past. The children helped me set up two Still Life on tables at either side of the classroom (similar to those of Peploe) and they all painted their interpretation of what they saw on the table. 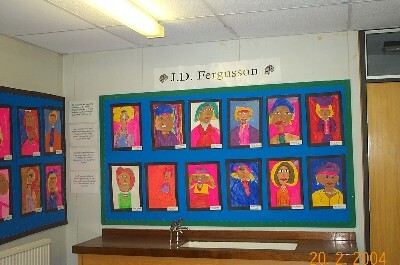 Also, we looked at the portraits the Colourists created, and focussed on the portraits of Fergusson, as the children seemed to really like the bright colours he used. 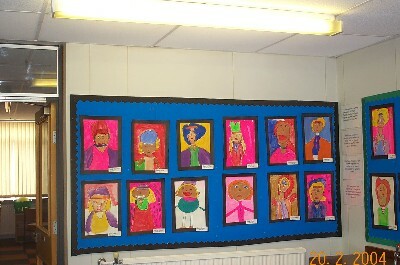 We used fluorescent paint to create our own portraits, looking at the person opposite us, and adding hats etc to create them in the style of Fergusson. 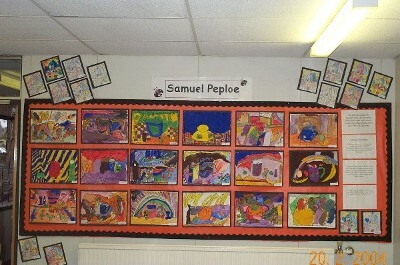 I was extremely pleased with the work they produced, and the class teacher, and children were very proud."